Was this a pure case coincidence, luck for the Government, or was it intentional? 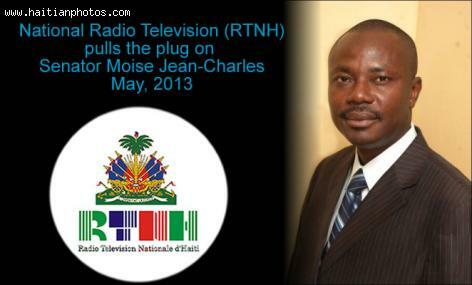 Following the sudden interruption of the retransmission several Senators went on publicly to denounce the action of Haiti National Radio Television (RTNH), wanting RTNH to terminate its retransmission altogether. Senate President Dieuseul Simon Deras solved the issue by proposing to conduct an investigation about the incident. Until a current investigation determines the nature of the technical failure presumably experienced by the National Radio Television (RTNH) during an intervention by Senator Moïse Jean-Charles at the meeting convened by the Prime Minister Laurent Lamothe, people on the media have been forming different opinions. Do you think is was intentional or just a coincidence? about the discuss about nation radio television rthn experience technical. its is really helpful or informative details. What was the outcome of the blackout during the inaugural ceremony of president Martelly? mimose wether you like moise or not this is a public radio station founded by the people of haiti not by michel martelly. in most democratic countries the person in charge will be under fire. i don t know where you live, in the united states if a republicain senator goes on the radio make a statement that president obama don t like and something like that happened specially if it is tax payer s funding, the radio station will be under investigation. A country receives the government it deserves. This is also true for Haiti unfortunately. Until we can collectively make better decisions for our future, we will continue to have Presidents like Michel Martelly who will appoint people who are not qualified for the job like Laurent Lamothe. The government will appoint people like those currently in charge of RTNH. Ke Nou Vle Ke Nou Pa Vle, Moise ap Presidan kan Minm. Se li sel ke Pep la Kwe Kap defan yo. All Moise Jean Charles is doing is playing politic and setting the stage for Lavalas. Moise Jean-Charles can not control his mouth. He is a problem for Haiti and the development of the country. In most counties in the world, he would have been in jail for telling so much stories that have any truth to them. Are we living in a communist system or yet, is the Duvalier regime back in power.